One of the best answers to the question “why build a home addition” is that your family simply needs more room. Many first time home-buyers purchase small homes or starter homes when they are getting established. After a few years, and a couple of children later, many find themselves faced with the hard decision to either move to a larger home or build a home addition onto their existing home. Frequently buying a new home involves uprooting children from schools and neighborhoods that the family is comfortable with. Consequently the decision for many to build a home addition, rather than sell and buy a new home, boils down to a desire to continue to live in their same town or community. The question on why build a home addition is also answered by economic conditions. Buying a home is typically more expensive than building a home addition. When buying a home there are closing costs and stamp taxes associated with selling the old home and buying the new one. In addition, there are new mortgage fees, higher property taxes and moving costs, even if the move is local. So for many homeowners the decision on why build a home addition comes down to the fact that building a home addition makes more economic sense then buying a larger home. Another major reason on why build a home addition is the freedom of design and creativity. Unlike purchasing a spec home, or existing home, building a home addition allows homeowners to design and build custom living space that is tailored to their family’s needs. In addition, with the right architect a home addition can be designed to complement both the home’s interior and exterior. Finally, building a home addition typically increases the value of a home. Most home additions pay for themselves in a short period of time in increased property value. Though a higher property value means higher property taxes, building a home addition also means more living space and a higher market valuation for the home. To help insure a positive return on investment for building a home addition, make sure your home addition is functional, aesthetically attractive, and does not significantly exceed the size of homes in your neighborhood. The market valuations of neighboring homes significantly play a role in the market value of your home. Building a new home addition that increases the size of your home by 2 times the size of neighboring homes is a recipe for a negative return on investment, even over a long period of time. So when asking yourself why build a home addition, see if you’re family and economic conditions meet one or more of these criteria. 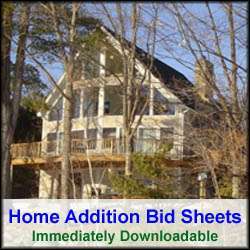 If so, then chances are your house is an excellent candidate for building a home addition.